The windows are situated in the north wall of the Quire and the south wall of the Navy Aisle (see Cathedral Plan). 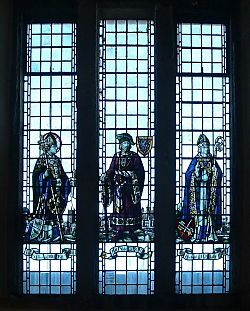 The first set of historic windows show King Alfred, St. Wilfrid and King Richard I, each in their different ways having laid the foundations of Portsmouth. King Alfred is seen as the founder of the Navy, in royal regalia standing by the sea with a longship behind him and a drawing of a ship he devised in his hand. St. Wilfrid was a missionary who roamed Britain and the Continent converting the Anglo Saxons to Christianity. He built a monastery at Selsey, founded the see of Chichester and brought Christianity to much of the south coast. King Richard I gave Portsmouth its first charter on the 2nd May 1194, having embarked from Portsmouth with his army to Normandy. It is seen in his left hand where it bears both the royal seal and that of William Longchamp, Richard's chancellor, the latter displaying the Star and Crescent which was subsequently adopted as the symbol of Portsmouth. 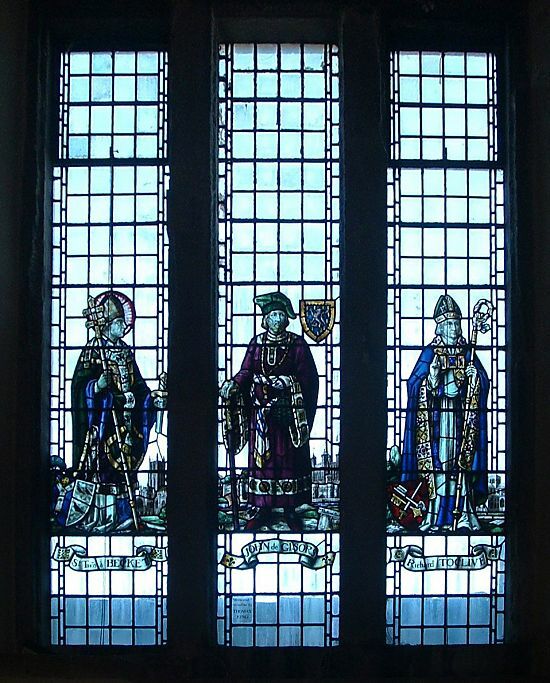 The second set of windows, relating to the foundation of the church itself, show St. Thomas Becket, John De Gisors and Richard Toclive. St. Thomas, the patron saint of the Cathedral, was murdered in Canterbury Cathedral in 1170, shortly before the foundation of this church. He is seen robed as an archbishop holding a broken sword, the tip of which is under his foot. John de Gisors gave the land on which the church was built to Southwick Priory, probably in 1180. He was descended from Payn de Gisors who was granted the manor of Titchfield by William II and who traded in hides from both Portsmouth and Gosport. Richard Toclive became Archbishop of Winchester in 1174 and is believed to have consecrated the first altar in the church, probably in 1188. He died in 1189 and was buried in Winchester Cathedral. 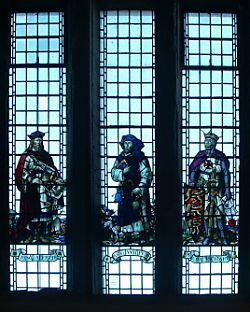 The last prior of Southwick was Richard Noxton (not Norton as it erroneously appears in the window) who signed the deed of surrender in 1538. Thomas Carpenter was known to have been Mayor of Portsmouth in 1531 and 1537 and that he built the first town hall. This was situated in the middle of High Street adjacent to St. Thomas's church. The window shows an orange seller as a reminder that the first oranges seen in this country were landed at Portsmouth. Shortly after Southwick Priory was dissolved, the patronage was bought by St. Mary's College, Winchester, of which John White was warden. 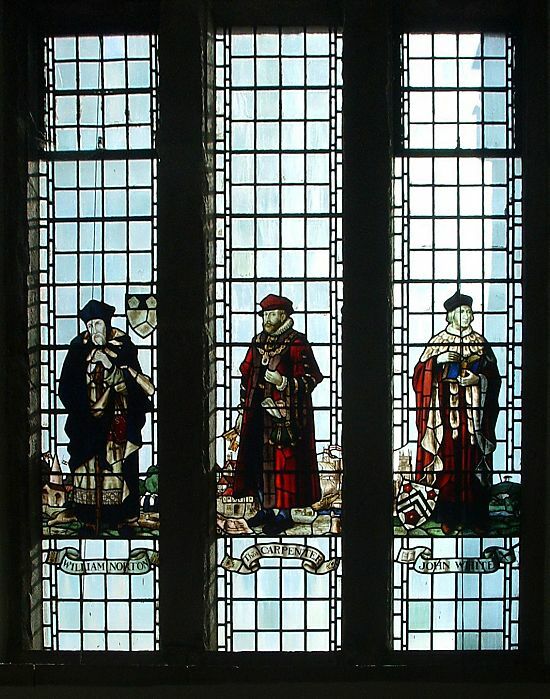 He was a staunch opponent of the reformation, favoured during the reign of Queen Mary but after her death was consigned to the Tower before retiring to Hampshire. The fourth set of windows recalls the restoration of the church following the bombardment it received in 1642 during the Civil War. Thomas Heather was the Vicar of Portsmouth in 1663 but it wasn't until he had been in office for 20 years that repairs to the church began. The tower and nave were demolished and replaced but the work was not completed until 1703, 7 years after Heather's death. 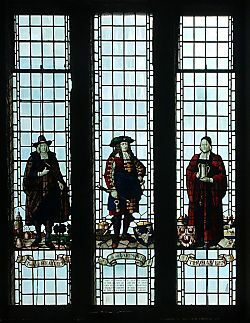 Lord Dartmouth was one of five trustees appointed by Charles II and charged with the task of raising the money needed for the restoration of the church. Dartmouth had served the king in many roles not least in the evacuation of Tangiers. He remained loyal when James II ascended the throne but switched his allegiance to William after the Glorious Revolution of 1688. Thomas Ken was made Bishop of Bath and Wells in 1684 the year after he had set sail with Lord Dartmouth for the evacuation of Tangier. 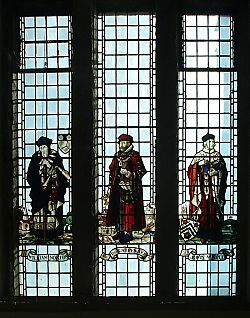 The window shows Ken holding a flagon which was part of the communion plate from Tangier and which was later given to Portsmouth Corporation for use at St. Thomas's. 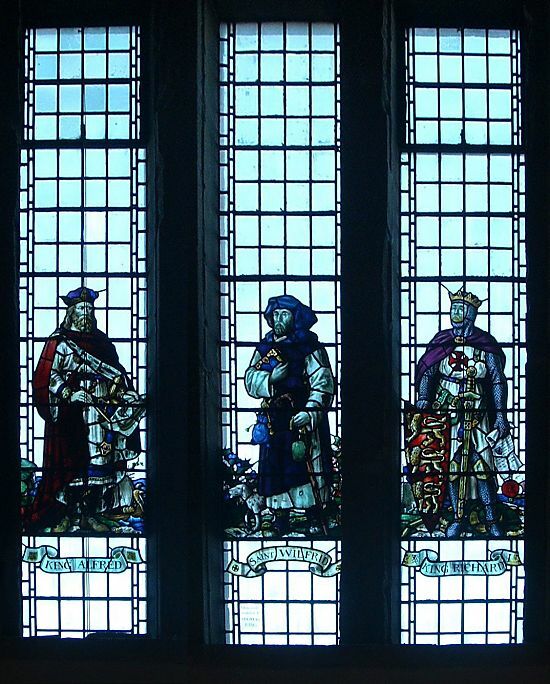 This set of windows is dedicated to the memory of George Long. For detailed accounts of the men pictured in these windows see Portsmouth Paper No. 27, "The Windows of Portsmouth Cathedral" by E.K. Barnard.